Aiden Byrne is perhaps best known in these parts (these parts being Ireland) for having won a Michelin star while head chef at The Commons Restaurant in Dublin. Prior to this Aidan had also picked. up serious experience while working for Conrad Gallagher at Peacock Alley and Paul Rankin at Roscoffs in Belfast. Alas it would appear that Aiden has been struck with Manchester’s Michelin star jinks. Top chef Aiden Byrne has been chosen as the man to lead the kitchen at Manchester’s most anticipated restaurant of 2018. Operator D&D will open 20 Stories at the top of newly-built 1 Spinningfields – and Byrne will leave Manchester House to take the reins. The restaurant is around 100 metres up in the sky and will put almost 300 covers into the city’s restaurant scene. D&D has has a record of bagging Michelin stars at some of its other brands, such as Launceston Place and Angler in London. 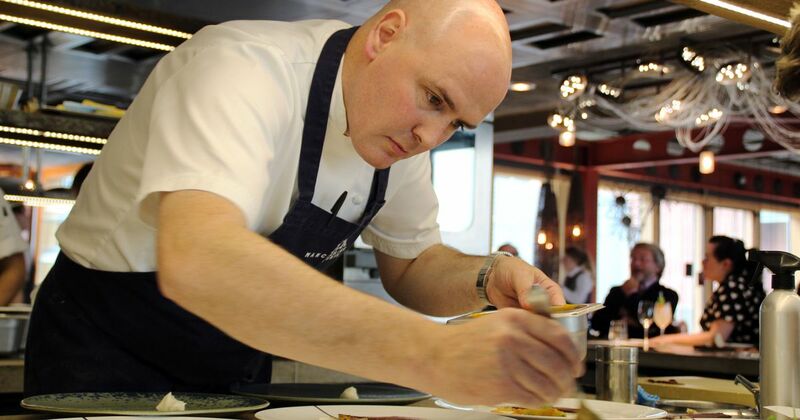 Byrne – once the youngest chef to achieve a Michelin star when he was awarded the honour at 22 – had been with Manchester House since its launch in 2013. More recently, he had been given an executive role overseeing other brands in the Living Ventures stable , such as Australasia, Grand Pacific and Artisan. Nathan Tofan was promoted to head chef at Manchester House. But the failure of Michelin to acknowledge Manchester House will have acted as a frustration for Byrne, who has decided on a new challenge.